In today’s competitive world, businesses need the right information at the right time in order to improve productivity, maximize utilization and increase profitability – enter M2M communications. With the advancement of technology, M2M communications have significantly evolved from merely connecting devices and enabling the collection of remote data, to sophisticated end-to-end solutions capable of gathering large amounts of data, processing data to identify valuable information and sharing that information with the appropriate parties in real-time, across multiple platforms—seamlessly. The desire for smarter and more readily available remote data has marked a significant development in the way data is acquired; mainly the interoperability of hardware, network and application solutions have evolved to deliver a reliable, cost effective and integrated way to track, monitor, control and manage assets anywhere in the world. In the span of only a few years, M2M technologies have found their way into diverse market applications including fleet and asset management, smart utilities, pipeline monitoring, and more. Detecting leaks and burst pipes is cumbersome and expensive. Manual meter readings require deployment of a troop of meter readers and a fleet of vehicles to take them everywhere the pipes go. Intervals between meter readings may be a month or more, which means leaks can go undetected for long periods of time. The labor-intensive workflow ends up being reactionary rather than preemptive. That’s costly. Even with automated meter reading (AMR) devices that report via private fixed radio networks, there is a heavy price to pay for initial setup and ongoing maintenance. There is a better way. M2M AMR/advanced metering infrastructure (AMI) solutions are implemented by water utility companies to prevent significant water loss due to pipeline leakage. These smart systems monitor the infrastructure around the clock and deliver notifications when irregularities are detected, allowing companies to reduce leaks by as much as 400%. In addition to efficiently identifying leaks, a comprehensive monitoring solution connects to other remote assets such as water meters, water quality sensors, flow sensors and level sensors, making it possible to obtain information as to flow rate, water levels, water quality measurements and quantity of water consumed. With process automation and access to smart data, utility companies are able to improve operations and reduce the costs and logistics associated with manual processes. M2M solutions are also active in the oil and gas industry to monitor and collect data from remote field equipment without having to send workers to the field. These solutions allow users to check equipment more frequently than was previously possible and save on labor costs, which can really add up when this includes isolated locations. In addition to regularly-scheduled field updates, event-based alarms and notifications allow organizations to react instantly to field issues, rather than losing money and remaining non-operational until a technician’s next scheduled appearance. Supervisory control and data acquisition (SCADA) solutions enable more efficient and cost-effective collection of operations-critical data such as tank levels, flow meter and pump bearing pressure readings, along with remote control operation of valves and other equipment. M2M technology is also widely used in applications for tracking vehicles and other mobile assets. Complete visibility of fleets helps businesses optimize route efficiency, control fuel costs, protect cargo and communicate with drivers. The range of capabilities here are limitless. A fleet management/asset tracking solution includes telemetry, notifications when vehicles enter or leave specified locations or stay in a location longer than specified, cargo tampering alerts, fuel usage reports, preventative maintenance scheduling notices, and status/position reports for intermodal shipping containers travelling via road, rail or sea. Solutions for the safe and regulation-compliant transport of refrigerated goods also rely on machine data to deliver status reports and alarm notifications if the cargo area temperature in a refrigerated vehicle strays above or below a specified range. In addition to temperature monitoring and compliance, two-way M2M devices make it possible for transportation companies to adjust trailer temperature remotely from a centralized location. Solutions for refrigerated monitoring based on machine data are integrated with comprehensive applications for analytics and sophisticated report generation to help users deploy their assets more efficiently, minimize costs and react quickly to emerging problems. With ships frequently out of range of conventional network communications, satellite-based communications have become highly valuable in maritime markets. M2M data coupled with satellite connectivity make it possible for businesses to manage fleets, enforce maritime and fishing regulations, manage fishing activities, monitor vessels, track oil spills with smart buoys and enhance the safety of seaborne crews anywhere in the world. For sophisticated maritime intelligence applications, customers combine M2M data with ORBCOMM’s Satellite AIS (Automatic Identification System) data to track vessels responsible for oil spills, identify illegal fishing, notify vessels of inclement weather, provide fuel-saving route information and assist in search and rescue operations. Government agencies and military organizations require secure and dependable communications to track and monitor personnel and mission-critical resources in remote regions. Monitoring solutions based on satellite/cellular connectivity allow governments and the military to track mobile and fixed remote resources such as vehicles, vessels and equipment. Satellite-based communication is also ideal for maintaining vital links with field and military personnel, as well as with valuable resources that travel across borders and into regions where other communication services are unreliable or unavailable. 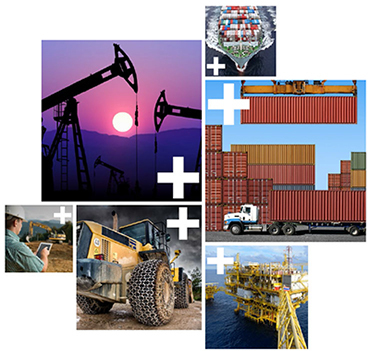 Whether monitoring a utility company, a fleet of trucks and containers or a flotilla of ships, organizations require solutions designed specifically to address their unique requirements. A complete and robust solution uses the power of multiple connection paths to increase communications reliability, the right device for the type of asset and a powerful user interface with the required functionality. A provider with a wide range of integrated solutions reduces interoperability issues and maximizes communication efficiencies. ORBCOMM provides the most comprehensive portfolio of M2M solutions with highly flexible connectivity options that cover a broad range of budgets. With a truly global reach, ORBCOMM delivers peerless M2M products and services that connect the world’s assets. A version of this article originally appeared in M2M Now Magazine.